I have been seriously enjoying pita bread back in my life! Why am I consuming bread of all things? Well, my mentors have found that when pairing grains with oils, the oil interferes with the fantastic quality of nutrition the grain has to offer. Mind boggling, I know! So, eliminate any and all oils when consuming any type of grain. Thankfully, I was able to find an incredible pita bread at my local Whole Foods here in Venice Beach that contained no oil! 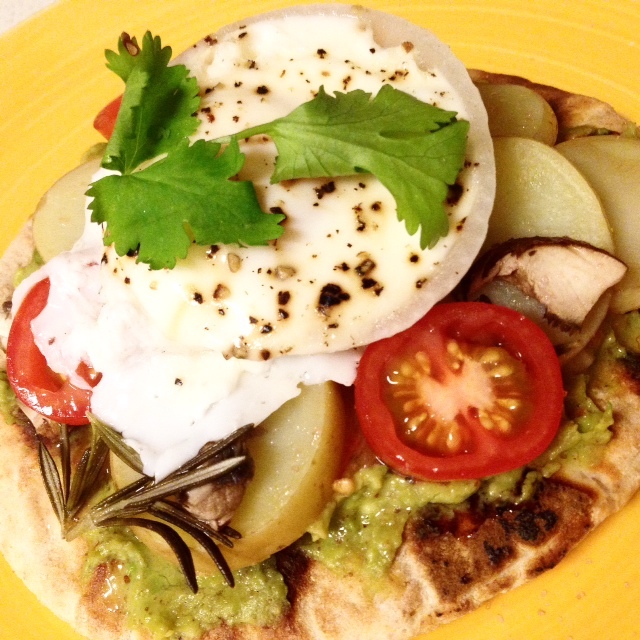 This Sunrise Pita Pizza is a great alternative for all that are looking for a post workout meal with adequate protein, raw unprocessed fat, vegetable starch, & no processed oils! Cut onion to make large onion rings. Best to cut onion to at least 1 inch in height to create a mold for the egg. in stainless steal pan. If you are not avoiding oil (like myself at the moment), then can use grass-fed butter, or coconut oil. Crack duck eggs into the center of the onion softy. Drop heat to medium-low so the egg can still be runny. Allow egg to cook sunny side up. No need to flip. Cover eggs with pot lid to cook the egg white all the way through by steaming. When using a lid, egg can cook at a faster rate. For a soft yolk, cover for 3 minutes. Once egg white is fully cooked, remove lift immediately. If you desire a harder yolk, leave lid on for an additional minute. I do not recommend cooking the yolk fully. Crack pepper over the surface of egg as egg cooks. Mix avocado with fresh squeezed lime juice, pepper, cilantro, a pinch of quality turmeric, & sea salt. Basically like guacamole. Mix until easy to spread. Spread Avocado over warmed pita bread. Savor every bite, & enjoy! Next postWe’re Living In A World Of POPs.